"DO More, With LESS" - Off Topic - Drive On Wood! A very well balanced approach book. Too many of the US east coast and west coast books and efforts are single-dedicated purposed. Ignoring as Coasters do: culturally, morally, climate/soils/possibilities of the whole center of the “fly-over” continent. For a gardening book in comparison to some of the pounds heavy 500+ page tomes that I’ve now collected up now; a very small 192 page, info dense informative/inspiring balanced-approach book. Hand methods as appropriate. Small power equipment as is needed. Results, and cost of results versus wasted pages of convincing-believer-spinning. Not in this book, but did you know that one gallon US of gasoline is equated to at least 200, to as high as 500 hours of humans-as-power, work-sweating? Hand whack a long ditch line versus a 2-stoke weed whacker. Set aside the gasoline chainsaw and arm-strong buck up with 6’ cross cuts and sweed-bowsaws. Silly to use three-four different gasoline power tools for a 10,000 square foot lot with a 3000 square foot-printed house attached garage and paved driveway. True story. One town neighbor just down the street. Power lawn mower w/bagger. Power hedge trimmer. Power turf edger. Finishing out with a power blower. Just as silly as the “view” property next to him if weed whack thier 40 acres by hand. That fellow could “to save carbon foot print” have himself and his now three teenage boys out hand swinging. Nope. Just like me a Stihl HD 2.5 hp forestry weed wacker. And 3-4 gallons of mix a year does it in all in under 100 hours annually. I couldn’t imagine putting up a years worth of wood for heating without gasoline by myself. Just dropping the trees and getting them to 8’ lengths takes up a lot of gasoline. Well wouldn’t you know it . . . . just ran across an acronym version of the LESS word. I got this book used for $1 at a used book sell. I though so much it would be typical ex-hippy green-spin that I bought a more traditional four family’s gardening stories book, “People with Dirty Hands” (makes for happiness) to balance out my mind input/outputs. “You are what you eat” is true - you WILL be influenced by what you read/let-into your head is true too. Why he is saying us moderns now are so, too addicted over-stimulated that itself becomes a weening off habit as bad as energy-hogging and being possessed by our lust for more and more Stuff. Interesting man postulating hard history based projections for civilizations/societies that once the growth blushed possibility’s were used-up/declining, then hard into expectations contractions. He says before we could ever get to a better-world-tomarrow; we surrounded by built-up/accumulated things of a dino-hogging-rich Today must go through a salvage-society phase. That it will take half a century to re-purpose/use-up what at a much lower energy-posibilites can never be maintained let along replaced. After the “fall” contraction of Rome many of the massive stone works were torn down and the cheap-labor slaves cut stone re-purposed to build more reasonable dwellings. Post WWII Berlin has mound-hill parks and expansion areas built up from the bombing rubble of hundereds of years accumulated buildings. Same for Tokyo. The 19th century steam iron-works mostly all got melted down for newer internal combustion 20th century works. He makes a lot of practical sence. In this book he says he will only recommend methods and tecniqics that he has done himself. Home energy conservation, small livestock, food gardening, etc. Had to give up his 1980’s years “Down Home Funk Lifesyle” after meeting, marrying and then comes a child phase of life. He now lives/recommends a self proclaimed “Retrofit” lifestyle. Old farm house improved, etc. One very, very interesting broad-society approach that he recommends is, “The Way of the Dissentious”. Woodgasing this means trying, developing many ways. No one way will fit all. No one way will fit all cercumstances. You see this try anything/everything approach in 'Ma Nature a lot. She spews seeds out capaciously letting circumstances sort out the survivors for that time and place. Multi birth critters one of her quick expansion to circumstances way. Ha! Anyhow as a current publication book of course I could not find another used copy. Ordered two more, new, to be able to gift out. use “Less energy. Have less Stuff possessing you… Subject yourselves to less Stimulation’s distractions.” And always to live long, happy and wise, keep the hands getting dirty used. Someone with English as first language might be able to help out with a more elegant translation. His one books “Green Wizardry” title is a bit offputting to me. I had visions of J.K. Rollins type spinnings. Entertaining with no practical application in real life. Not at all. In this book his premise was those who post Rome’s collapse did do the rereading learning of the previous civilization’s hard facts science’s and engineering then to the middle ages unlearned would appear to be able to do magic/wizard. So Today while it is easy Do learn batteries, electrical generations, good wood stoving, practical effective gardening, water pumping and all of the other assorted acknowledges. Later in a “de-industrialization” situation then you will become the capable getter-done wizard. And he says quite correctly that whether you are a modern day hobo voluntary opting-out; or a shed off US, UK, Canadian manufacturing cog; a previous seemed to be critical service person (telephone switch board operator, print film processor and such) involuntary de-industrialization forced relearning is at best, just a few unemployment checks period away. Have one or two basic needs sellable/barterable skills developed always as backups. My Registered-Nurse wife? Understanding germ theory “clean and dry” attentive hands-on, works wonders past high-tech dressings and patent Pharma treatments. Her basic understanding of organic-chemistry makes her soups and pies the highest fund raising auction items. $60. pies fund raised just last Sunday. A very good translation of a fine human wisdom J.O. True a thousand years ago. True today. Will be just as true a thousand years from now. Mine too much Stuff nemesis became rechargeable starting batteries. Not use a piece of equipment for longer than four-six months and then it was no-use until a battery recharge. The batteries were owning me, slaving me - not servants anymore. Ha! Battery retired most here and rejiggered all of the boxes to take a common use size. ANY new equipment if at all possible is arm-strong pull starting types. Only four starting batteries now total ( and the wife demanded pocketed ear-pulling cell phone). Betcha’ the JD Ag tractor not used since last spring - will not crank over now. Oh. Well. Keeping up with the must maintain four location free-range hatched out baby chicks low watering stations seems so much more important. Grow babies grow. So I can revert back to just the two adult open topped buckets. You see . . . .tried them all. Nozzle water’ers clog, or worse yet, stick open draining out the supply. Self-replenishing water-ers this time of year grow black and green molds demanding detailed scrubbing out. Ice freeze and crack/split in the winter. The Wizards apprentice helper old story overcome by his set-loose buckets is a learning wisdom lesson too. but did you know that one gallon US of gasoline is equated to at least 200, to as high as 500 hours of humans-as-power, work-sweating? According to these analyses, a barrel of petroleum has a real human labour equivalent of 5 2/3 years at olympic athlete grade, and 11 1/3 years at normal fit grade. And average north American yearly consumption is in the range of 60 barrels per year. Calculate that now in terms of wages. All for a bulk price of some $40 a barrel. And consider that our food production system requires roughly 10 calories of FF energy for each calorie of food delivered. We are heavily addicted and accustomed to essentially give away energy. It has utterly infiltrated our entire culture from living choices through to chosen approaches to almost any task, and our standards for how things should be done, and even what makes sense to do. 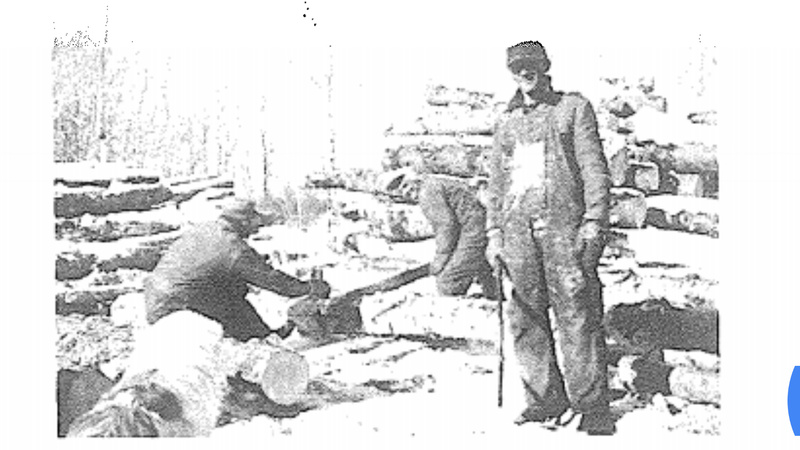 People did cut firewood to heat uninsulated homes with poor stoves. They also didn’t dismay if the water pail froze by morning, they had extra blankets. 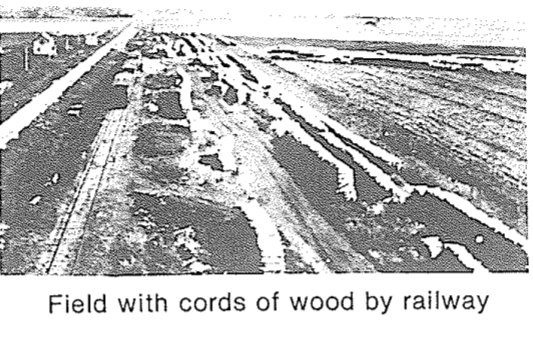 They cut and split cordwood by hand, hauled it with horses for shipping by train to cities. They were very skilled and efficient at each process they undertook. Steve is correct to aim to consciously do more with less, and to try to unlearn fossil fuel culture practices and relearn the truly sustainable ones, hopefully while improving over historical approaches. Yes. Yes to you both. Just like the mind/heart/soul explorers of old-times, getting that deep culture disconnect to winnow down to the core actual real needs sometime will require “30 days and nights in the wilderness”. In current-day American-English the young lady’s Pacific Crest Trail self-discovery hike shows a route to this. The book and movie “Wild”. Based on a real true human discovery experience. Gary Tait having watch for an hour the two different demonstration drag-saw set-up’s sure has drawn me back again and again to wood sawing REAL requirements. When I was a little kid my father and a partner had an old, old, very worn out drag-saw they would use. Heavy, heavy, slow to move and set up. The old gasoline engine cranky and hard to start, keep running. Prone to catching on fire on hot summer days, even. Why to my little kids eyes this was a Dragon-saw. Dad soon went onto chainsaws 2.5 to 5 hp. Later me, yet onto a 24", 7 tooth circular swing blade mill. 20 hp engine driven. Those old drag saws were really just an early engine assisted cross cut sawing set up. The same crosscut saw that was back and forth’ed by two men. Two fit men would have at best been ~1/2 horsepower driving. A well, properly sharpen cross cut saw is fairly fast. Really. 1/4" cut on each push, or, pull stoke. Now make up drag-saw with sealed ball bearing arms and link ends. Power it with a DC electric motor. That motor woodgas direct electrical powered; or charged battery “fueled”. Do more, with less energy used, with only a small trade off in speed will always be the winner. To document my previous comments, here are historical pictures from the history book from my district. I apologize for the poor resolution, due to the pdf form of the online book. Cordwood piled over an 8th of a mile long in multiple rows, each pile a different man or crews work. To be loaded into boxcars, to be sent to cities east and west. 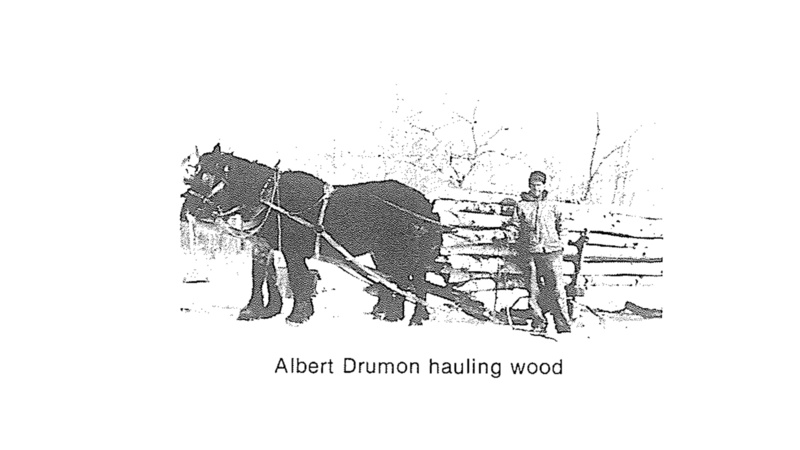 Prior to the rail line being built around 1903, they hauled timber on the snow with horses 12 miles north to the CP main line. The foreword of the book describes what the compiler saw over his long life, the area transformed from timber camps and sawmills to nothing but shelter belts around farm yards. It had been called “The bad woods”, almost impossible to clear, stands of huge American elm, green ash, bur oak and trembling aspen. Lady slippers, wild plum, high bush cranberry, diamond willow, hawthorn, chokecherries, pincherries, etc. Now it looks like it was originally a prairie. When I was young large tracts of original forest still existed. It grew very valuable timber, and probably was better for producing lumber and fuel wood than canola and soybeans. Our ancestors worked harder, and smarter than most can imagine. 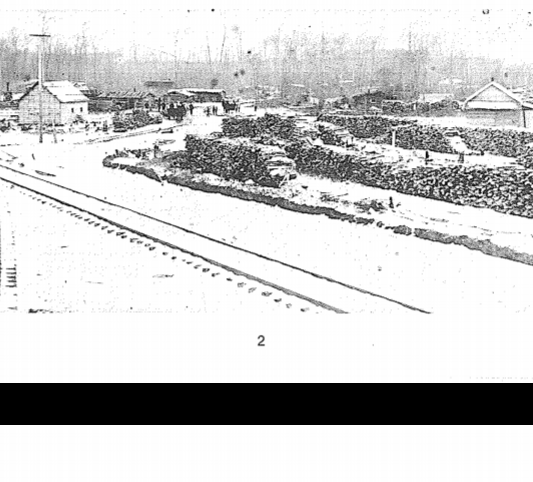 To carry on with what Gary said, this is a picture of the logs being moved to the sawmill a little over 100 years ago here in Crivitz. This is a picture of downtown Crivitz today and how they get the logs from the forest to the rail head for shipping to who knows where. Probably Japan where we have shipped several of our paper mills. That’s aspen to the right, right? On the second last pic. Do not feel Mr.Lonely on eastern North American trees IDing TomC. I have books. Still . . . hard not living back there exposed to year-around direct-seen changes. Out far-west here it is much fewer species easy-boring. here it is referred to as poplar or birch. Garry already confirmed aspen. I know it’s definately not birch, but I don’t know what poplar looks like. I don’t think we have it here. Maybe further south. I have to look it up. Just had a visitor from Iceland this afternoon. He looked at some poplar and said that’s birch. I said no and took him out in the woods and showed him paper birch, gray birch, black birch, and yellow birch. He didn’t seem convinced. After he left I got out my dendrology book. What I know as Popple is populus tremuloides. The birches are all betula, but there is a canadian wire birch also known as poplar leaved birch. Maybe this is related to european varieties? Hm…this is getting more complicated than I thought possible. I know we have a couple of varieties of birch, but they are all very simular. They are all just birch to us. Poplar is even more mysterious to me now that I read we don’t have it in Sweden. I guess I have to do some more studying. Btw, Thodal is a Norwegian name, isn’t it? I’m sorry, I’ve forgotten where you live.